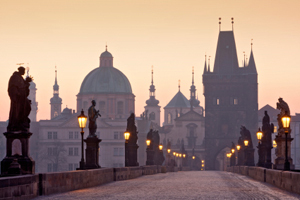 Prague is also known as the City of a Thousand Spires. While the number may be debated, this city has experienced it all. Prague is home to centuries of Bohemian kings, classical composers, invading Nazis, Soviet tanks and much more–yet the spires survived it all. It is the spires that have created one of Europe’s (if not he world’s) most romantic skylines. Take a stroll over the Charles Bridge at dusk or row a boat down the Vltava River and you will be hooked. Prague will bring out the romanticist in us all. The Dancing Building. The Dancing Building. 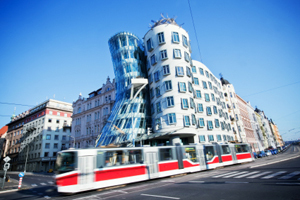 Also known as “Fred and Ginger,” the Dancing Building simulates movement while maintaining its functionality. Its innovative design and surprising use of curvature have given it notoriety. The Astronomical Clock This clock in Old Town Square is one of Prague’s most popular sights. 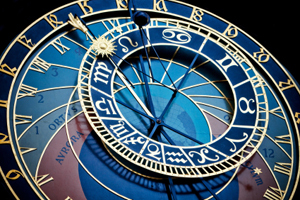 The original parts of the clock date back to the 1400s, but the clock has been updated throughout the centuries. Figures emerge from the clock upon the hour. Be prepared for crowds eager to watch the clock’s mechanisms if you’re trying to snap photos. The Charles Bridge.Prague’s signature landmark is a 600-year-old gothic stone bridge lined with baroque statues of 30 religious figures, the most recent added in the 1930s. The bridge is magical at any time, but come early in the morning or at night when the crowds thin out. Prague Jewish Museum. The museum is a compendium of five surviving synagogues, the remnants of what was once a thriving Jewish ghetto. It includes the Pinkas synagogue, its walls marked with the names of 80,000 Czech Jews who died in Nazi concentration camps. If you are prepared for a deeply moving exhibit, they have pictures drawn by children held at the Theresienstadt (Terezin) camp. It is located next to the Old Jewish Cemetery, impossibly packed with four centuries of headstones, and worth a visit as well. Wenceslas Square is the large commercial center of Prague, which is adjacent to the National Museum and is near the State Opera House. As you walk along the Square, you’ll see shops and restaurants, including the art deco Hotel Europa, which is a great place to stop for an apple strudel. The square was home to demonstrations both at the beginning and the end of the Communist Regime in the Czech Republic, so there is also a profound sense of history among the new commerce of a growing nation. Be sure to stop at one of the many kiosks selling sausage and Czech beer for a snack. Petrin Hill, rising some 400 feet over the left bank of the Vltava River, is also a spectacular vista for the entire city of Prague. Surrounded by parks, Petrin Hill is accessible by walking or by the funicular, which transports visitors up and down. At the top of the hill you’ll find a replica of the Eiffel Tower, which is another climb worth risking. You’ll also find a house of mirrors as well as the famous Hunger Wall, a defensive structure which was built by Emperor Charles IV between 1360 and 1362 to provide work for the people of Prague. Click here for more information on Group Travel to Prague.